Send cute innocent ponies to the meat grinder. Just how unpleasant can a horse be? Well, if you've ever been kicked in the face by one, or stood just that little bit too close while one is engaging in fierce urination, the answer is quite unpleasant. It's unlikely, though, that you'll have ever been dragged screaming into spinning metallic blades of death in the name of points accumulation. If you have, then it's probably academic, because you'll be dead, or lacking the limbs required to relive the experience via PopCap's oddball freebie. Born out of PopCap's desire to make a game in 24 hours, a name was drawn out of a hat, and 'Unpleasant Horse Racing In The Sky' came into being. For reasons best known to their shrinks, the 4th & Battery team elected to make a game where you control an evil black horse on a mission to drag white ponies into a meat grinder. Classy. 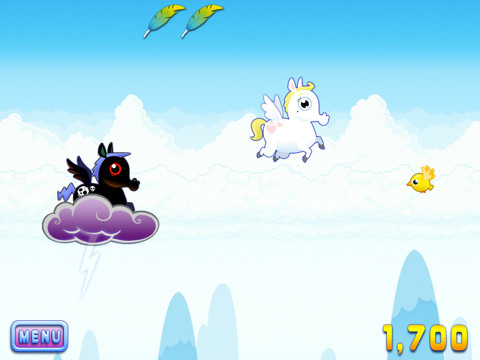 Despite having wings, your Unpleasant Horse's flying abilities are poor to say the least, so getting around requires leaping from cloud to cloud while stealing passing birds. But the real fun, evidently, comes from taking the opportunity to jump on the backs of passing ponies and send them plummeting into the mincer. As bones and gristle spray into the sky, it's advisable to beat a hasty retreat and leap away before you meet a similar fate. The longer you delay your departure, the more points you score. Points! And that's all there is to this slightly deranged gore fest. If Extreme Noise Terror had provided the soundtrack, we would be tempted to crown it the satanic Robot Unicorn Attack. 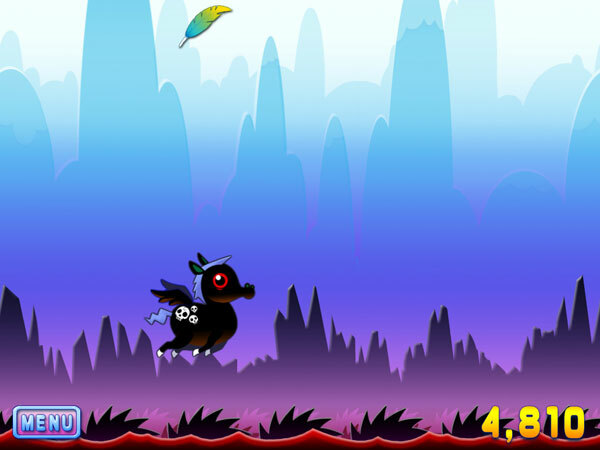 What's Hot: Dark concept, nice amount of gore, free. What's Not: Not much to the game.